Congratulations to David S. Noble, Jr., our most recent alumnus (CSE MS Spring 2013), who just landed a job at CD-adapco, makers of scalable high-quality software for computational fluid dynamics applications. 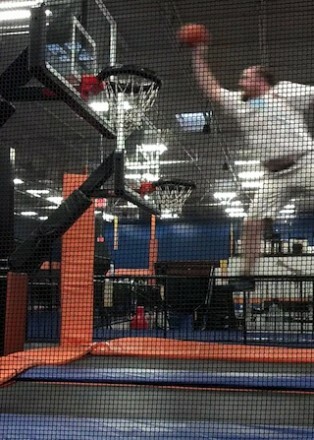 To celebrate, Dave unveils his highly graceful swan-like dunking ability in this 3-second video clip (~ 6 MiB QuickTime movie): Dave_Dunk_Attempt. The HPC Garage at Georgia Tech studies high-performance computing. Our work spans parallel algorithms, programming models, performance analysis, automated tuning (autotuning), and debugging. We target applications in computational science and engineering (CSE), which include computer-based simulations of natural and engineered systems and analysis of massive data sets.